I got another care package!!!! I want to say thank you so much to my cousin Karen and Scott Davis. They sent me the most amazing Halloween treats. 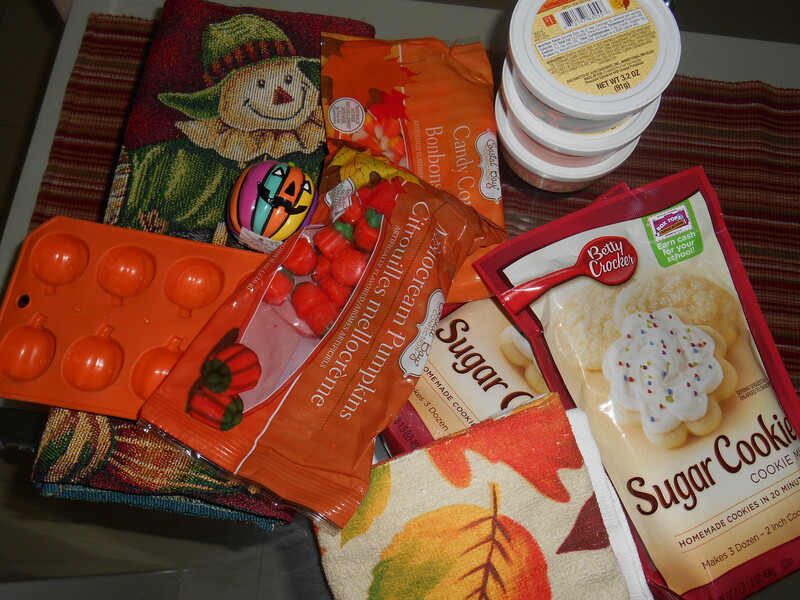 Just look at it, there are multicolored sprinkles and sugar cookie mix and molds to make little pumpkins and other Awesome things! The kids all sent me Halloween pictures that they colored for me to hang up around the house. Karen sent me spider rings that I am giving out as prizes this week in my classes for any kids who participate in the costume contest. I’m also going to use the candy corn and pumpkins to decorate baked goods to take to my friend Tammy’s Halloween Party on Friday. I’m really excited about the possibility of cooking all the holiday baked goods. 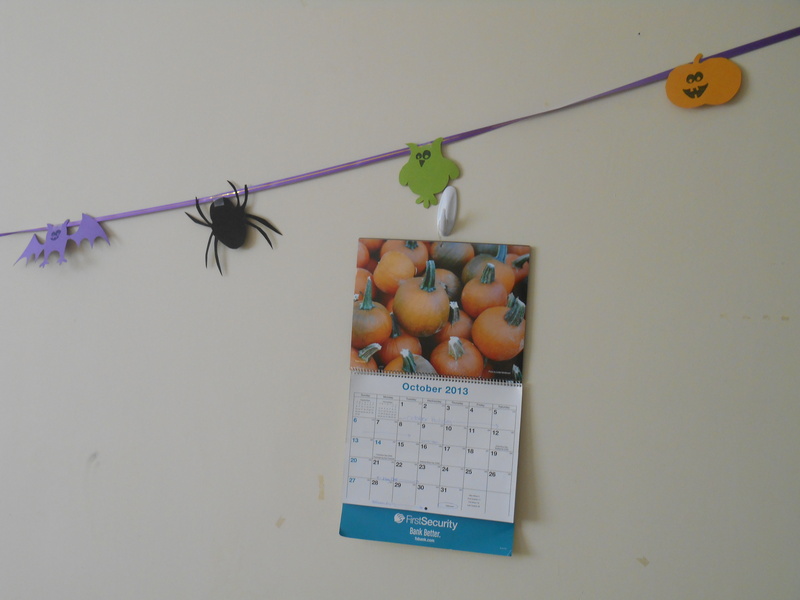 I’ve started decorating the apartment with a few things here and there to get in the Halloween spirit. I decided not to carve a pumpkin this year, although I could get some variety of gourd or pumpkin at the vegetable market. They are just not the same as back home, and I don’t really have a place to put it. Oh, also my electric has been out the past two days. Apparently someone dug up an electric line on Sunday morning and it’s going to take three days to fix. I spent the night yesterday with Jim and Kaila so I can get a hot shower this morning. I didn’t bring a lot of household goods with me to China so I’ve got to go out shopping today and find a flashlight and some candles. I probably should get those anyway just in case the power goes out again. Can you imagine anything creepier than the electricity going out on the week of Halloween? How ironic. 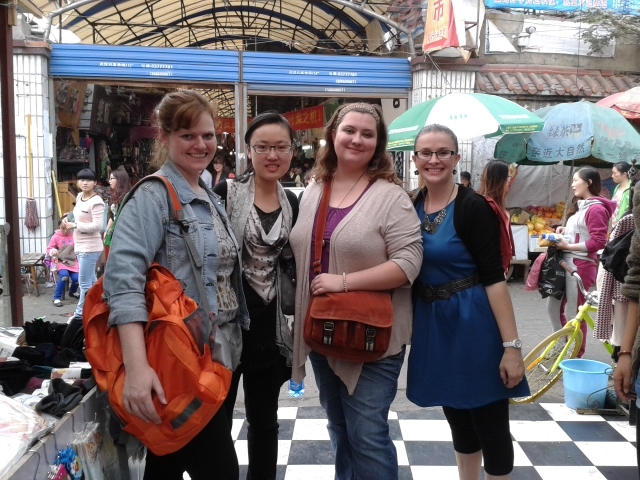 Also this weekend Katie, Amy and Kaila and I went to the market on Huquan Street. It was so much fun walking around the booths looking at everything. We got chased out of one of the stores where the lady told us in no uncertain terms that we were too big to fit the clothes. Nothing like being told you are not “China Sized”. I found a set of sheets for my spare bed. I’m pretty excited that I can have company stay over now and actually have sheets for the bed. I got cutsy ones with moneys and rainbows on them. The lady at the market kept pointing me to a set with roses on them which apparently she thought were more appropriate for my age, but I mean, why should I have to buy grown up sheets anyway? 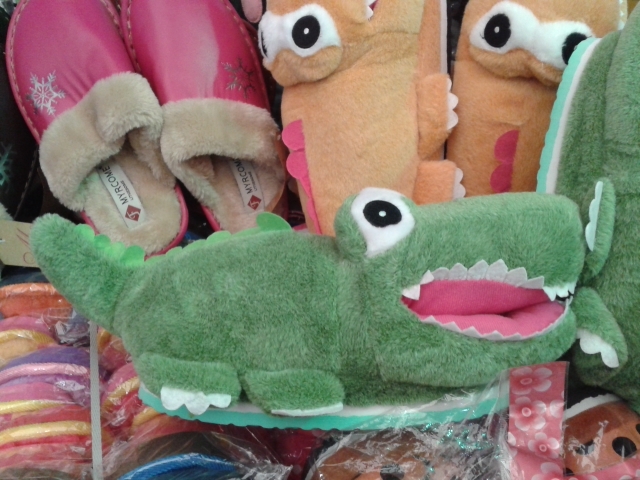 I don’t really know how to end today’s post, so I will leave you with a picture of an alligator slipper. You put your foot in the alligator’s mouth to wear the shoe. Aren’t they the cutest thing ever? Previous Post To China, With Love. I’m so glad that there will be a place for people to go for Thanksgiving. I’m sure it means a lot for those who may not have a lot of family close by. The leaves haven’t started to change here yet, it’s just now beginning to get cold. I was trying to put my jean jacket on over a thick sweater the other day and ripped a hole clean down the back of it (I’ve had the jacket for 10 years though). Anyhow, I think I may be able to use my big winter coat here soon so it shouldn’t be a major issue. Hope everything is going well. Also, you asked about mail. It seems to be taking about 6 weeks or so to get mail. If anyone wants to send something though, try to make sure it also has my phone number on it, otherwise it tends to get lost in the mail for weeks at a time. The mail room here at school is a large warehouse type building with millions of packages laid out side by side on the floor and you root around until you find the one you are looking for, so it’s easy for things to get misplaced if there is no phone number on it. I love you all. Tell everyone I said hi. Love that package! So glad you have enjoyed both of your recent surprises!! Grace is going as Cleopatra this year and Samuel is “Perseus, Son of Poseidon” (Greek mythology lol). Did you get my message that we are studying China this week? Would love to Skype you. Season is going to help us by coming and cooking some Chinese dishes this week. We send our love and wish you a happy week! It was so good to talk to you and the kids the other day. They asked some hard questions. I don’t know that much about China other than the little bit of it that I’ve seen so far, but I hope they enjoyed our chat. I’m trying to replicate your Christmas Cookie Exchange this year for some of my friends here, but it won’t be the same as being at home with you all. I hope things are going well and I love you all. Happy Halloween! Love reading your posts…I try to keep up as much as I can! Thank you so much Semra! It’s really good to hear from you. I love what I’m doing here in China. I’ve made a lot of friends and my students are an amazing group of kids. Some days I get homesick and just want to stay in the apartment listening to Country music and baking sugar cookies but most of the time I’m glad to be immersed in the culture here. I’ve picked up a few Chinese words so far but nothing too much really. I feel like I’m actually making a difference in people’s lives which is fantastic and makes everything else worthwhile. I just hope I can make it through the holidays. That’s always the hardest time of year to be away from home. I’m also trying to make plans for Spring Holiday since I’ll have about 6 weeks off work to travel.